Officials watch as the dome is lowered onto permanent piers. TOURISM Development & Investment Company (TDIC), the master developer of major cultural developments on Saadiyat island in Abu Dhabi, said the dome of Louvre Abu Dhabi has been successfully lifted and placed into its final position – firmly sitting on top of the museum’s four main permanent piers. The lift process included raising the dome off the temporary towers and then lowering it 38 cm down on to the permanent piers. The final touchdown took place in the presence of TDIC board chairman Ali Majed Al Mansoori and other senior officials. Preparations in the run-up to the lifting of the dome included extensive testing of the bearings that will hold the dome throughout its lifespan. The bearings underwent months of testing in California, US, where it was proven they can support the final weight of the dome. The lift was made possible with the utilisation of 32 hydraulic jacks that can hold up to 10,000 tonnes in weight and which were operated simultaneously and remotely. The jacks were manufactured for the project, underscoring the complexity and uniqueness of the museum’s design and construction. The dome of the museum, which was constructed over the span of 10 months, was originally built on top of 120 temporary towers as a way to support its weight during the construction process. Commenting on the feat, Al Mansoori said its lift is the first of its kind in the world of construction for a permanent structure of this scale and size. The dome weighs 7,000 tonnes and is 180 m wide. 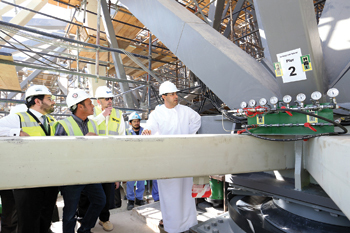 “We are proud of the successes and milestones being achieved on the site of Louvre Abu Dhabi. We applaud the dedication and hard work of the teams working together to achieve this unprecedented work that reflects the best of the worlds of architecture, engineering and construction today,” he added. This also attests to the continued drive of the UAE to be one of the few countries in the world where unique projects such as this one, which require innovation and technology, can happen, stated Al Mansoori. “We can only look forward with high anticipation to what Louvre Abu Dhabi is going to bring to the world of art and culture regionally and worldwide,” he added. “It is remarkable in its design and size, and given that it must be placed in precise spots on its four piers, there was no room for error. One would not believe the amount of detail that goes into achieving the results we have realised today,” he added. Construction is progressing on site of Louvre Abu Dhabi. To date, the concrete work has been almost completed. Furthermore, a total of 34,000 tonnes of reinforcement steel has been used and over 21 million man hours completed on-site. The construction of the permanent gallery structures have been completed, along with the concrete work for the museum’s basement levels and the security screening facility – a highly secure 7-m-deep basement through which authorised vehicles will transport all the artwork of the museum. Moreover, work is progressing on the 1.2-km Saadiyat tunnel which will be the main entryway for the artworks as they are transported to their destination. Designed by Pritzker-prize winning architect Jean Nouvel, Louvre Abu Dhabi will encompass 9,200 sq m of art galleries. The 6,681-sq-m Permanent Galleries will house the museum’s permanent collection, taking the visitor through a journey from the most ancient to contemporary art works from different civilisations. There will be a dedicated space of 2,364 sq m for temporary exhibitions.